A lot of people are spending more time outdoors. Increase your outdoor time with family and friends by building your own outdoor kitchen with the use of one of these outdoor kitchen designs. It saves on air conditioning bills! Always read the outdoor kitchen designs carefully and make sure that there is enough information provided for you to be able to complete the project - before you invest in materials. Some of the plans are excellent, giving a great deal of instruction in text, pictures and drawings while other plans are only drawings and still others are only sketches. As well, some of the outdoor kitchen designs, require a woodworking shop that is outfitted with a good selection of stationary power tools such as a table saw, jointer and thickness planer. In most cases the outdoor kitchen designs will have to be modified to suit your space requirements. These outdoor kitchen designs are for the intermediate to expert woodworker. Note: Outdoor kitchen designs usually require plumbing and electrical knowhow. 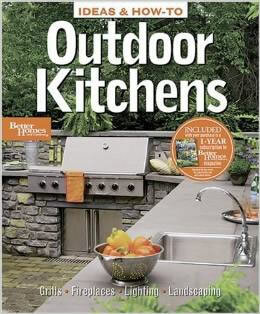 Selection of outdoor kitchen books . Outdoor kitchen with wood burning oven. Outdoor kitchen design - island. Outdoor kitchen design - grilling area. Outdoor kitchen design - with garden. 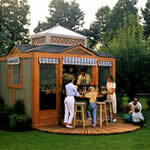 You don't have to worry about an unexpected rain storm with this enclosed outdoor kitchen design - pavilion. The Aspen outdoor kitchen design is a chef's dream! However, there are no instructions or detailed plans. This outdoor kitchen design has all the essentials. However, there are no instructions or detailed plans. Oasis outdoor kitchen design - there are no instructions or detailed plans. 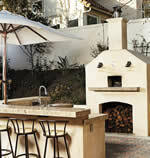 Outdoor kitchen design photo gallery. Outdoor kitchen design - bar and grill. Planning an outdoor kitchen design, this article will give you a lot of useful tips and information. Sonoran outdoor kitchen design - there are no instructions or detailed plans. 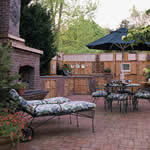 Bistro outdoor kitchen design - there are no instructions or detailed plans. Bayside outdoor kitchen design - there are no instructions or detailed plans.